I'm slowly learning to juggle life with a second child, sleepless nights, milk scented clothes and one active toddler. It is not always easy. It is never the same. But at the end of the day, when I finally lay my head on the pillow, I am content. I am happy with my life, my family, my hectic days, my messy hair and the uncomplicated and unsophisticated, but always heartwarming, dishes I've been making lately. We've been having these potatoes at least once a week for the last couple of weeks. They may not look like much. 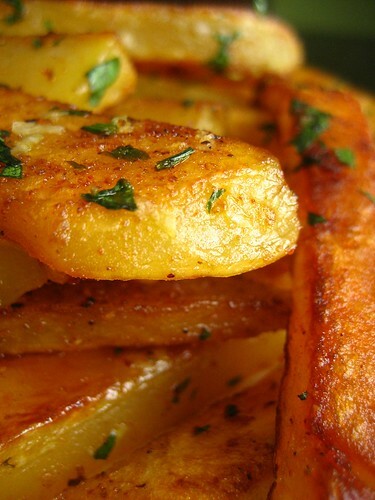 After all, they are just roasted potatoes sprinkled with herbs and garlic and some spices. Though I do believe that when equipped with a good potato specimen and the right amount and the right combination of spices, nothing beats Roasted spiced potatoes. The recipe comes from my sister in law, who is a great cook and an even greater baker. What I like about this dish, besides being comforting and spicy and delicious, is that I can do it with my eyes half open. Perfect for my lethargic state these days. Peeling and slicing the potatoes is the only work you would do. The Potatoes basically cook themselves and the rest is chemistry between the herbs, the sharpness of the garlic, the freshness of the lemon and the warmth of the cumin, paprika and Harissa sauce. Perfect as a side dish with a roasted chicken or lamb. So whether you have five minutes or five hours to spend in the kitchen, set a date to try these weeknights potatoes of mine. I guarantee you will love them. Preheat the oven at 400F. 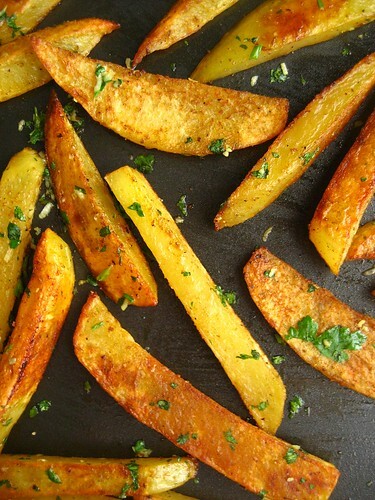 Peel and slice the potatoes into wedges or fries. Put them in a bowl, along with the olive oil, salt, black pepper, ground cumin, paprika and harissa, if used. Toss the potatoes to combine. Arrange them in a baking sheet in a single layer and bake until golden brown and crisp on the outside, turning them over once, about 25-30 minutes. Mix the herbs, garlic, lemon juice in a bowl. 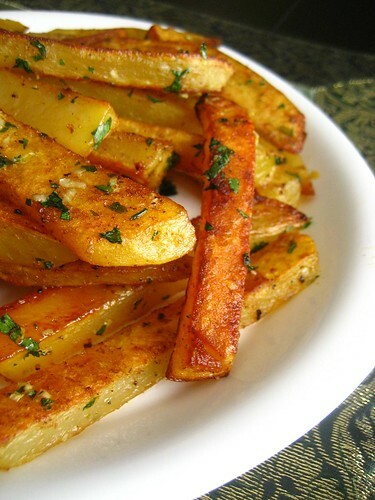 When the potatoes are baked, toss them quickly with the garlic infused herbs and serve. Préchauffer le four a 200C. Peler et couper les pommes de terre en fine ou larges frittes. Mettre dans un bol avec l'huile d'olive, paprika, cumin en poudre, sel, poivre et Harissa, si souhaité. Faites cuire jusqu'à une belle coloration dorée, environ 25-30 minutes et en remuant les potatoes une fois. Une fois cuites, mélanger avec le reste des ingrédients and servir aussitôt. I will definitely be making these. They look so yummy. cc ma ser , jador tes frite , elles paréssent apétissante.j'imagine que c'est trés dur pour toi en ce moment .courage .quand tu vois cette petite bouille tu oublis tout.bisous a vs .
- Merci Yaya! Et merci pour le coucou. Je te fais de gros bisous. - Lisa, please let me know how you like them when you get a chance! So yummy! And I like the fact that it can be done " my eyes half open"! je suis sure que çà ne va pas durer et que......dans quelques mois....nous retrouverons la cuisinière hors paire que tu es!!! et surtout,n'oublie pas,n'y va pas trop franchement avec l'harissa...bébé Kenza "techob chib"!!!! I may have a kale blog, but I am a huge potato fan and roasted herbed or spiced potatoes are really my idea of a great meal, no matter what else is on the plate (or not!). In addition, your comments about juggling life that includes a second child just brought back a flood of many memories. My second child is now 27 and getting married this coming summer. How very very lucky I am to have all those similar memories of smelling like milk, the simple days of taking care of babies, having crazy hair, the only 'accomplishment' being getting supper ready, and then happily falling into bed. Hugs & I so love potatoes! I'm so impressed that you're cheerfully coping with baby and toddler , the house and delicious food AND blogging about it . Thankyou for sharing another delicious recipe . Yum, these look so good; and pretty to boot! They look so crispy, awesome! These were just divine, even without the harissa! Congratulations on your lovely daughter and your ability to keep your world turning all the while. I know it can't be easy. I am going to have to try these out once I get back into the kitchen! Recette absolument délicieuse que je vais essayer sans tarder. Just found your blog today and have spent the last two hours reading and looking at your beautiful pictures. These potatoes look amazing. I'm turning on the oven right now! Congratulations on the birth of your baby. Thanks for sharing so many great vegetarian and vegan recipes. Those almond cookies look so YUM! I just find your blog and I am so happy. You have many great recipes here! And those potatoes are my favorite! Although potato may not be my favorite, but this dish is too good to resist. I know what I'm making for dinner tonight! Congratulations! I realize this is now months delayed, but as I also have a relatively young second, I find it sometimes difficult to regularly visit my favorite sites! Kenza is beautiful and your potatoes look delicious. Will try these ASAP. More pictures of Kenza, please! - Thank you all for your comments and your kindness. Happy to hear that some of you who tried this recipe enjoyed it as much as we did and still do. I'll be back to posting more recipes very soon. OMG - my mouth is watering. These are definitely on the menu tonight! - Glad you and your guest enjoyed them. Thanks for letting me know! Oh my! That looks really delicious! I can't wait to try it. Though I have not written before, I have enjoyed your blog for some time. I am very glad to read that you will be posting again soon. Hope all is well with you. They look amazing! Golden and crisp, well done. ok I'm a builder and cooking just isn't my thing until I saw those potatoes. Gave it a go last night and they were amazing. Thank you for sharing. These look and sound so scrumptious. I'm going these a try on the family this week. I just found you today and I am so distracted by the lovely pictures, I keep forgetting to actually read the recipes! - Samah, welcome! Harissa is a hot sauce. It's considered in Algeria as a condiment. You use it either on the side or stirred at the end of the dish, or you mix it with other spices to make a marinade. Its use is endless. My husband is the one who makes it at home. Stay warm in Canada! Ma3a essalama!